Semi-evergreen or deciduous shrub with small glossy mid-green leaves. Trusses of broadly funnel-shaped flowers in spring, varying in colour from buff-pink to salmon-red, orange-red or scarlet. Moist, well drained humus rich acid soil. Prefers full sun. Very hardy. 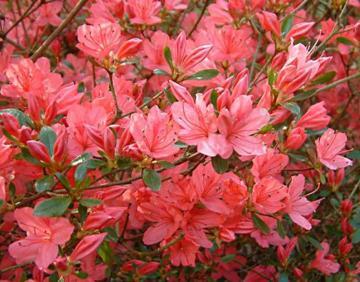 Parent species of many Kurume hybrid azaleas. Introduced from Japan by Professor Sargent in 1892.